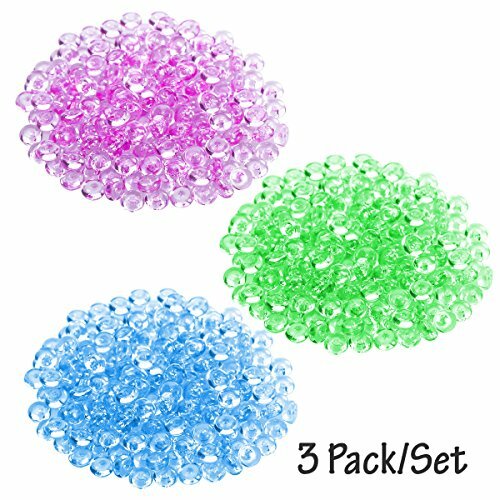 This item comes with 3 packs of multipurpose crystal beads which are manufactured for decorating vase, fishbowl or for homemade crunchy slime. They are perfect for you to relax yourself and kill time in daily life. What's more, they are also great choices to make DIY crafts to prepare your handmade gifts or as party decorations. ✅ Color: Light purple, fruit green and light blue. ✅ Size: Approx. 0.6 x 0.6 x 0.25cm/ 0.24 x 0.24 x 0.1 inch (LxWxH). ✅ Makes you want to squeeze it over and over to release stress. Made of plastic with smooth surpface, so the beads will not hurt you when you touch them. ✅ Can also inspire your child's interest and add more fun. Good way to relax for you and your children. ✅ Wide application : Good for making slime, filling the vase, flower arrangements, DIY craft, sticking to gift box, home party, wedding decoration and so on. ✅ Comfortable touch, durable and long lasting. ✅ Crunchy: FISHBOWL SLIME is the best crunchy slime on the web. The cold, wet slime makes your hands want to squeeze and squash over and over. you can search "fishbowl slime" on youtube to learn more about it. ✅ Wide application！These flat beads also can be used in vases, flower arrangements, aquariums, centerpieces, and accents in home decor.Add "Bright Side Crafts LED Bright Lights" vase and accent lights for an amazing effect. ✅ NO GLASS 100% plastic, will not hurt your hands when you make or play your slime Smoothly: They are smooth beads with no sharp edges which makes them perfect for fishbowl slime! If you have any questions about this product by Mega Shop, contact us by completing and submitting the form below. If you are looking for a specif part number, please include it with your message. Wood Bead Stringing Board Beading Sorting Tray 24"